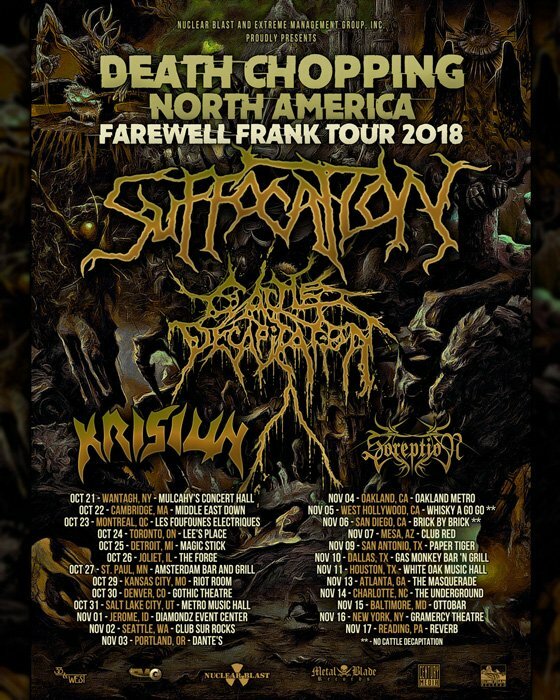 Suffocation vocalist Frank Mullen is set to retire this year after fronting the tech death outfit for three decades, and the band have mapped out a farewell run of tour dates to mark the occasion. The run will keep the band on the road throughout October and November, and will feature support from Cattle Decapitation, Krisiun and Soreption. A pair of Canadian dates will first bring the four-band bill to Montreal's Foufounes Electriques on October 23, followed by a date at Lee's Palace in Toronto the following night on October 24. Tickets for all shows go on sale Friday (August 10). Find the complete itinerary below.